Since the beginning of anti-government protests in March 2011, Syrian security forces have killed more than 4,000 protesters, injured many more, and arbitrarily arrested tens of thousands across the country, subjecting many of them to torture in detention. These abuses, extensively documented by Human Rights Watch based on statements of hundreds of victims and witnesses, were committed as part of a widespread and systematic attack against the civilian population and thus constitute crimes against humanity. This report focuses on the individual and command responsibility of Syrian military commanders and intelligence officials for these crimes. It is based on interviews with 63 defectors both from the army and from the intelligence agencies, generally known as the mukhabarat. These defectors shared with Human Rights Watch detailed information about their units’ participation in violations and the orders they received from commanders at different levels. The defectors provided information on violations that occurred in seven of Syria’s fourteen governorates: Damascus, Daraa, Homs, Idlib, Tartous, Deir al-Zor, and Hama. Human Rights Watch interviewed all of the defectors separately and at length. Violations described in this report are those that were described separately by several defectors and with sufficient detail to convince the researcher that the interviewees had first-hand knowledge of the incidents in question. Several accounts have been excluded because interviewees did not provide such detail. The statements of soldiers and officers who defected from the Syrian military and intelligence agencies leave no doubt that the abuses were committed in pursuance of state policy and that they were directly ordered, authorized, or condoned at the highest levels of Syrian military and civilian leadership. Human Rights Watch’s findings show that military commanders and officials in the intelligence agencies gave both direct and standing orders to use lethal force against the protesters (at least 20 such cases are documented in detail in this report) as well as to unlawfully arrest, beat, and torture the detainees. In addition, senior military commanders and high-ranking officials, including President Bashar al-Assad and the heads of the intelligence agencies, bear command responsibility for violations committed by their subordinates to the extent that they knew or should have known of the abuses but failed to take action to stop them. Syrian authorities repeatedly claimed that the violence in the country has been perpetrated by armed terrorist gangs, incited and sponsored from abroad. Human Rights Watch has documented several incidents in which demonstrators and armed neighborhood groups have resorted to violence. Since September, armed attacks on security forces have significantly increased, with the Free Syrian Army, a self-declared opposition armed group with some senior members in Turkey, taking responsibility for many of them. Syrian authorities have claimed that more than 1,100 members of the security forces have been killed since the beginning of the anti-government protests in mid-March. However, despite the increased number of attacks by defectors and neighborhood defense groups, witness statements and corroborating information indicate that the majority of protests that Human Rights Watch has been able to document since the uprising began in March have been largely peaceful. The information provided for this report by defectors, who were deployed to suppress the protests, supports that assessment and underlines the lengths to which the authorities have gone to misrepresent the protesters as “armed gangs” and “terrorists.” But there is a risk—as seen in hard hit places like the city of Homs—that bigger segments of the protest movement will arm themselves in response to attacks by security forces or pro-government militias, known as shabeeha. Considering the evidence that crimes against humanity have been committed in Syria, the pervasive climate of impunity for security forces and pro-government militias, and the grave nature of many of their abuses, Human Rights Watch believes that the United Nations Security Council should refer the situation in Syria to the International Criminal Court (ICC). Crimes against humanity are considered crimes triggering universal jurisdiction under international customary law (meaning that national courts of third states could investigate and prosecute them even if they were committed abroad, by foreigners and against foreigners). All states are responsible for bringing to justice those who have committed crimes against humanity. “Abdullah,” a soldier with the 409th Battalion, 154th Regiment, 4th Division, said that two high-level commanders, Brigadier General Jawdat Ibrahim Safi and Major General Mohamed Ali Durgham, ordered the troops to shoot at protesters when his unit was deployed to areas in and just outside of Damascus. “Mansour,” who served in Air Force Intelligence in Daraa, said that the commander in charge of Air Force Intelligence in Daraa, Colonel Qusay Mihoub, gave his unit orders to “stop the protesters by all possible means,” which included the use of lethal force. “Hani,” who served in the Special Operations branch of Air Force Intelligence, said that Colonel Suheil Hassan gave orders to shoot directly at protesters on April 15 during a protest in the Mo`adamiyeh neighborhood in Damascus. “Amjad,” who was deployed to Daraa with the 35th Special Forces Regiment, said that he received direct verbal orders from the commander of his unit, Brigadier General Ramadan Mahmoud Ramadan, to open fire at the protesters on April 25. Human Rights Watch collected extensive information about the participation of specific military units and intelligence agencies in attacks against the protesters in different cities and large-scale military operations that resulted in killings, mass arrests, torture, and other violations. The appendix to this report contains information on the structure of the units, locations where they were deployed, violations in which they were allegedly involved, and, wherever this information was available, the names of their commanders or officials in charge. The exact number of those killed is difficult to verify given the government-imposed restrictions on independent reporting inside Syria, but the United Nations High Commissioner for Human Rights has put the figure at more than 4,000 as of December 2, 2011, while the Violations Documentation Center (VDC), a monitoring group working in coordination with the Local Coordination Committees (LCC), a network of Syrian activists, has compiled a list of 3,934 civilian deaths as of December 3, 2011. The Syrian government has stated that more than 1,100 members of the security forces have been killed. According to information collected by Human Rights Watch, the Syrian security forces have conducted a massive campaign of arbitrary arrests and torture of detainees across Syria since the beginning of anti-government protests in March 2011. Information provided by the defectors, many of whom personally participated in arrests and ill-treatment, further corroborates these findings. The defectors described large-scale, arbitrary arrests during protests and at checkpoints, as well as “sweep” operations in residential neighborhoods across the country. Most of the arrests appear to have been conducted by the intelligence agencies, while the military provided support during the arrest and transportation of detainees. The number of people arrested since the beginning of the protests is impossible to verify. As of December 3, 2011, the VDC had documented almost 15,500 arrests. The real number is likely much higher. “Said,” who was deployed to Talbiseh with the 134th Brigade, 18th Division, said that after the military moved into the town in early May, intelligence agencies and the military started conducting daily raids, arresting “anyone older than 14 years—sometimes 20, and sometimes a hundred people.” Said also said that the arrest raids, authorized by the mukhabarat and the military, were accompanied by “brazen looting” and burning of shops. “Ghassan,” a lieutenant colonel deployed in Douma with the 106th Brigade, Presidential Guard, said that his brigade, on average, arrested about 50 people, any male between ages 15 and 50, at his checkpoint after each Friday protest. According to the defectors, arrests were routinely accompanied by beatings and other ill-treatment, which commanders ordered, authorized, or condoned. Those who worked in or had access to detention facilities told Human Rights Watch that they witnessed or participated in the torture of detainees. The defectors from both the military and the intelligence agencies who were involved in the arrest operations said that they beat detainees during their arrest and transportation to the detention facilities almost without exception. They cited specific orders they received from their commanders in this respect. While most of the defectors interviewed said they were only involved in transporting the detainees to various detention facilities, a few, mainly those who served in intelligence agencies, said they had first-hand knowledge of the situation inside the facilities. Their statements confirm the widespread use of torture in detention previously documented by Human Rights Watch and provide additional details on the intelligence officials in charge. One of the most worrisome features of the intensifying crackdown on protesters in Syria has been the growing number of custodial deaths since the beginning of July. Local activists have reported more than 197 such deaths as of November 15, 2011. Two defectors interviewed by Human Rights Watch shared information about the summary execution of detainees or deaths from torture in detention in two areas: Douma, and Bukamal. A lieutenant colonel who served in the Presidential Guard said that he witnessed a summary execution of a detainee at a checkpoint in Douma around August 7, 2011. A defector who had been posted in the eastern town of Bukamal, by the Iraqi border, said that he saw 17 bodies of anti-government activists including a number that had surrendered to an intelligence agency several days earlier. Defectors also provided further information about the denial of medical assistance to wounded protesters, the use of ambulances to arrest the injured, and the mistreatment of injured individuals in hospitals controlled by intelligence agencies and the military, a disturbing pattern that Human Rights Watch and other organizations have previously documented. Several examples cited by the defectors strongly suggest that these violations were ordered, authorized, or condoned by commanders rather than committed at the initiative of individual members of the armed forces or intelligence agencies. According to the defectors, security forces brought some of the wounded protesters directly to the detention facilities where they mistreated them. They said that injured protesters who were brought to the military, or military-controlled, hospitals were also subjected to mistreatment and beatings by intelligence agents and hospital staff. Those whose wounds were serious and did not allow for immediate transportation were held in temporary detention facilities on hospital premises before being transferred to other places of detention. Given the widespread nature of killings and other crimes committed in Syria, scores of statements from defectors about their orders to shoot and abuse protesters, and the extensive publication of these abuses by the media and international organizations, it is reasonable to conclude that the senior military and civilian leadership knew or should have known about them. The Syrian military and civilian leadership also clearly have failed to take any meaningful action to investigate and stop these abuses. Under international law, they would thus be responsible for violations committed by their subordinates. With regards to President Bashar al-Assad, who is the commander-in-chief of the Syrian armed forces, and his close associates, including the heads of intelligence agencies and the military leadership, Human Rights Watch has collected additional information that strongly indicates their direct knowledge and involvement in the violent crackdown on protesters. Human Rights Watch believes that, in addition to military and intelligence officers mentioned in connection with specific incidents in this report, these commanders, including the highest-ranking officers and heads of intelligence agencies, should be investigated on the grounds of their command responsibility for violations committed by units under their control. Under the Rome Statute of the International Criminal Court, criminal liability applies to both those who physically commit the crimes and to senior officials, including those who give the orders and those in a position of command who should have been aware of the abuses but failed to prevent them or to report or prosecute those responsible. The consequences for disobeying orders and challenging government claims about the protests have been severe. Eight defectors told Human Rights Watch that they witnessed officers or intelligence agents killing military personnel who refused to follow orders. Three defectors told Human Rights Watch that the authorities had detained them because they refused to follow orders or challenged government claims. At least two said that security forces beat and tortured them. Other defectors interviewed by Human Rights Watch said that security forces detained and tortured them for participating in protests during leave or before they started their military service. The defectors interviewed by Human Rights Watch said that security forces detained them for relatively short terms in detention centers on their base or in nearby detention facilities. According to witnesses other defectors were sent to the notorious Tadmor military prison in Homs governorate. A prison guard from Tadmor told Human Rights Watch that by the time he defected in August the prison housed about 2,500 prisoners. While the prisoners initially included only military personnel, the prison started receiving a growing number of detained protesters and defectors after protests erupted in March. He told Human Rights Watch that security forces there beat and tortured all prisoners, but gave defectors particularly harsh treatment. One defector said that security forces arrested a close relative to force him to return to his unit. Virtually all defectors interviewed by Human Rights Watch said that they were convinced that officers or intelligence agents would kill them if they refused to follow orders. In standard operations to suppress protests, they said that conscript soldiers from the army or intelligence agencies lined up in front, while officers and intelligence agents stayed behind, giving orders and making sure that they followed orders. On several occasions, officers and intelligence agents explicitly threatened to kill soldiers if they did not follow orders. Most of the defectors said that they tried to evade orders by aiming at protesters’ feet, or firing in the air, but in some cases felt that they had to shoot at the protesters or commit other abuses because they thought that they would themselves be killed otherwise. A few took up arms against intelligence agents and officers who ordered the killings, and many said they defected when they realized that their commanders were ordering them to shoot at unarmed protesters as opposed to the “armed gangs” that they had been told to expect. The Syrian government’s response to credible accusations of human rights violations has been inadequate and has fostered a climate of impunity, including for unlawful killings, torture, enforced disappearance, and arbitrary detention. Human Rights Watch is not aware of any public information about specific investigations or prosecutions related to violations described in this report. While many states have condemned Syria’s use of violence and some have followed those words with actions aimed at pushing the Syrian government to change course, the international community has been slow to take collective action. Considering the evidence that crimes against humanity have been committed in Syria, the pervasive climate of impunity for security forces and pro-government militias, and the grave nature of many of their abuses, Human Rights Watch calls on the United Nations Security Council to refer the situation in Syria to the International Criminal Court—the forum most capable of effectively investigating and prosecuting those bearing the greatest responsibility for the crimes committed and offering accountability to the Syrian people. The Security Council should also require states to suspend all military sales and assistance to the Syrian government and adopt targeted sanctions on officials credibly implicated in the ongoing grave, widespread, and systematic violations of international human rights law. Human Rights Watch also calls on all states, in accordance with their national laws, to bring to justice under the principle of universal jurisdiction those who have committed crimes against humanity. This report is based on 63 interviews with defectors from Syria’s armed forces and intelligence agencies. Human Rights Watch researchers conducted these interviews in person in Syria’s neighboring countries from May to November 2011. Researchers also interviewed dozens of witnesses in Syria and in neighboring countries to establish the context of the anti-government demonstrations in Syria and corroborate defectors’ statements. Human Rights Watch researchers conducted the interviews in Arabic or with the help of Arabic-English translators. The defectors interviewed by Human Rights Watch served in regular army units, the Special Forces, the Military Police, the Presidential Guard, the General Intelligence Directorate, the Air Force Intelligence Directorate, and in other units. While the majority were conscript soldiers, 14 defectors said they had served as officers, the highest-ranking being a lieutenant colonel. Their units were deployed to suppress protests all over Syria, including in the governorates of Damascus, Daraa, Homs, Hama, Idlib, Tartous, and Deir al-Zor. Syria has been and remains under an information blockade, and obtaining information about the government crackdown on protesters is extremely difficult. Those who speak to investigators or share information through electronic means face severe repercussions. To protect defectors, other witnesses, and their families, Human Rights Watch has changed their names and withheld information about the location of the interviews. In the report, pseudonyms are indicated with quotation marks. Human Rights Watch interviewed all of the defectors and other witnesses separately and at length. Violations described in this report are those that several defectors described separately and with sufficient detail to convince the researcher that the interviewees had first-hand knowledge of the incidents in question. Several accounts have been excluded because interviewees did not provide such detail. The majority of incidents described in this report mention the names and ranks of commanders who allegedly gave orders to commit the abuses. In some cases, it was possible to corroborate these allegations through independent interviews with two or more witnesses. In other cases the report gives the name and rank of a commander based on the statement of one defector, but only if Human Rights Watch researchers deemed this was justified by the level of detail and the credibility of the overall evidence provided. While a single person’s statement cannot be the basis of a definitive conclusion about the responsibility of the commanders in question, Human Rights Watch believes that such allegations require a prompt investigation. Protests in Syria broke out on March 18 in response to the arrest and torture of 15 school children by the Political Security Directorate, one of Syria’s intelligence agencies, in the southern city of Daraa. Attempting to suppress the demonstrations, security forces opened fire on the protesters, killing at least four. Within days the protests grew into rallies that gathered thousands of people. Protests quickly spread to the rest of the country in a show of sympathy with the Daraa protesters. The government’s violent response only further fueled demonstrations. At the time of writing, protests are still taking place regularly in the governorates of Daraa, al-Hasaka, Idlib, Deir al-Zor, Homs, Hama, and in the suburbs of the capital, Damascus. Syrian security forces, primarily the intelligence agencies, referred to generically as mukhabarat, and government-supported militias, referred to locally as shabeeha, regularly used force, often lethal, against largely peaceful demonstrators, and often prevented injured protesters from receiving medical assistance. As the protest movement endured, the government also deployed the army, usually in full military gear and backed by armored personnel vehicles, to quell protests. While consistent witness statements leave little doubt regarding the widespread and systematic nature of abuses, the exact number of people killed and injured by Syrian security forces is impossible to verify. At the time of writing, Syria remains off-limits to international journalists and human rights groups, and communications are often interrupted in affected areas. However, an expanding network of activists grouping themselves in local coordination committees (LCC) and making extensive use of the Internet, including social media, and reporting the information to a monitoring group, the Violations Documentation Center (VDC), have compiled a list of 3,934 civilians killed, including more than 300 children, as of December 3, 2011. Syrian authorities went to great lengths to convince the public, both Syrian and international, as well as the members of security forces deployed to quell the protests, that “criminals” and “armed terrorist gangs,” incited and sponsored from abroad, have been responsible for most of the violence. On October 7, Syria’s deputy foreign minister, Faisal Mekdad, told the UN Human Rights Council (HRC) that his country was “grappling with terrorist threats” and promised to give the UN a list of “more than 1,100 people who have been killed by the terrorists,” including civil servants and police. In an interview with the British Sunday Times newspaper published on November 20, 2011, President al-Assad blamed “armed gangs” for the killing of 800 members of his security forces. As this report illustrates, however, in at least some cases members of the security forces fell victim to friendly fire or deliberate killings for their refusal to follow the orders. Defectors interviewed for this report also said that in many instances the dead and injured whom the authorities claimed through the state media had been killed or wounded by "armed gangs" and "terrorists" were actually the victims of the government's repression. Human Rights Watch has documented several incidents in which demonstrators, at times supported by military defectors, have resorted to violence. For example, demonstrators set government buildings on fire in the towns of Daraa, Jisr al-Shughur, and Tal Kalakh, destroyed monuments to President Bashar al-Assad and his father Hafez al-Assad, and torched several vehicles belonging to the security forces. Witnesses described some of these episodes to Human Rights Watch; we also viewed evidence of such attacks on amateur videos available online. Several witnesses also told Human Rights Watch that protesters had killed members of security forces, usually after the security forces had opened fire on them. At the same time, statements from witnesses, including defectors, protesters, and journalists, indicate that the protesters have been unarmed in the majority of cases documented by Human Rights Watch and other human rights organizations. In addition to shooting at protesters, security forces launched a massive campaign of arrests, arbitrarily detaining hundreds of protesters across the country, routinely failing to acknowledge their detention or provide information on their whereabouts, and subjecting them to torture and ill-treatment. The intelligence agencies have also arrested lawyers, activists, and journalists who endorsed or promoted the protests, as well as medical personnel suspected of caring for wounded protesters in makeshift field hospitals or private homes. Human Rights Watch documented large-scale arbitrary detentions, including the detention of children, in Daraa, Damascus and its suburbs, Banyas and surrounding villages, Latakia, Deir al-Zor, Tal Kalakh, Hama, Homs, Zabadani, Jisr al-Shughur, and Maaret al-Nu`man. Many of the arrests appeared entirely arbitrary, with no formal charges brought against the detainees. It appears that most detainees were released several days or weeks later, but others have not reappeared. Many of those cases constitute enforced disappearances, as their families have had no information on their fate or whereabouts for a prolonged period of time. Released detainees, some of them children, said that they, as well as hundreds of others they saw in detention, were subjected to torture and ill-treatment. All of the former detainees interviewed by Human Rights Watch described appalling detention conditions, with grossly overcrowded cells, where at times detainees could only sleep in turns, and lack of food. In several cities, including Daraa, Tal Kalakh, Rastan, Banyas, Deir al-Zor, Hama, and parts of Homs, Syrian security forces moved into neighborhoods in military vehicles, including tanks and armored personnel carriers, under the cover of heavy gunfire. They imposed checkpoints, placed snipers on roofs of buildings, and restricted movement of residents in the streets. In some places, like Daraa, the security forces imposed a full-out siege that lasted for several weeks, cutting off all means of communication and subjecting residents to acute shortages of food, water, medicine, and other essential supplies. In March 2011 the Syrian government began deploying security forces from the armed forces, the intelligence agencies, and the shabeeha to quell the protests. First in Daraa, and later, as this report illustrates, in Damascus, Deir al-Zor, Idlib, Hama, Homs, Latakia, and Tartous governorates, the armed forces and intelligence agencies, often working in concert, conducted operations to stamp out the protests. Intelligence agencies overlap extensively, and there are no clear rules for which agency will take the lead in a particular action. These agencies have virtually unlimited de facto authority to carry out arrests, searches, interrogation, and detention. They are more than a simple arm of the government; they are in practice autonomous entities that report directly to the highest officials in the Syrian state, and according to some analysts, directly to the President. Units from the armed forces deployed to quell the protests include the Presidential Guard, the 3rd, 4th, 5th, 9th, 11th, 15th, and 18th Divisions, and various Special Forces Regiments, including the 35th, 45th, and 46th Regiments. Service in the armed forces is compulsory for adult males and the majority of army defectors are low-level conscripts. More detailed information regarding the specific military units and intelligence agencies involved in the attacks against protesters in different cities and large-scale military operations is provided in the appendix to this report. This includes information on the structure of the units, locations where they were deployed, violations in which they were allegedly involved, and, where this information is available, the names of their commanders or the officials in charge. Soldiers in the unit were under close surveillance; we couldn’t really talk to each other. As for cell phones, they were never allowed, but this rule was never enforced. But starting in April, commanders started breaking the cell phones whenever they caught somebody using them. All TV channels were banned, aside from official Syrian TV. Every morning commanders conducted a meeting, talking about how good Assad and his family were, and about the threats from the terrorists. And then they also forbade us from taking leave. It used to be eight days every two months, but after April nobody was allowed to go. We were told that there are terrorist groups coming into the country with funding from Bandar Bin Sultan [a prominent Saudi prince who served until 2009 as Saudi's national security chief], Saad al-Hariri [a former Lebanese prime minister], and Jeffrey Feltman [US Assistant Secretary of State for Near Eastern affairs]. Usually, I wrote the news segments myself and higher-ranking officers only made minor edits to what I wrote, but when I wanted to report on the protests in March, the commanders gave me a prepared statement instead of looking at what I had written. The statement said that terrorist gangs were attacking civilians. Some of my relatives had been participating in the protests, so I knew better. I refused to read it on air, saying that I was not feeling well, but somebody else read it instead. Defectors from units serving in a number of governorates all over Syria described similar measures taken to prevent them from finding out what was happening, indicating a high-level policy to restrict soldiers’ access to information. When the events started in Daraa, the officers took all our TVs, radios, and phones. The only news we got was through internal radio, and it was all about hooligans, foreign elements, etc. Most of us believed it, and we were scared; even the movement of birds and butterflies would set off shooting. For many of the defectors, the turning point came when they were finally allowed to go home on leave. The realization that close relatives and friends were participating in the protests and had been attacked by the security forces convinced many that the government’s claims were false. Some even participated in protests themselves while on leave. A few of the defectors said that it was the killing or arrests of family members and friends during protests that convinced them to defect. At one point we killed eight people in 15 minutes. The protesters were unarmed. They didn’t even have rocks! That’s when I decided to defect. I threw away my gun and ran towards the protesters. Somebody picked me up in a van and took me home to Daraa. Defectors also said that they became disillusioned by officers planting weapons in mosques, frequent friendly fire incidents between intelligence agents and army soldiers, and claims, intended to mislead, that “armed protesters” and “terrorists” had killed soldiers who had actually been killed by intelligence agents, friendly fire, or accidents. Since the beginning of anti-government protests in March 2011, Syrian security forces have killed more than 4,000 protesters and bystanders in their violent efforts to stop the protests, according to UN High Commissioner for Human Rights Navi Pillay. They have injured many more and arbitrarily arrested tens of thousands across the country, subjecting many of them to torture and ill-treatment in detention. Local activists have reported more than 197 deaths in custody. Human Rights Watch has collected and publicized extensive documentation on these violations committed in governorates of Daraa, Homs, Damascus, Hama, and other places across the country. Human Rights Watch believes that these abuses were committed as part of a widespread and systematic attack against the civilian population and thus constitute crimes against humanity under customary international law and the Rome Statute of the International Criminal Court. The independent, international commission of inquiry on Syria appointed by the UN Human Rights Council and set up by the Office of the High Commissioner for Human Rights (OHCHR) has reached the same conclusion. The statements of soldiers and officers who defected from the Syrian military and security forces leave no doubt that the widespread and systematic abuses, including killings, arbitrary detentions, and torture, were committed in pursuance of a state policy targeting civilians or against the civilian population and that they were directly ordered, authorized, or condoned at the highest levels of Syrian military and civilian leadership. For individuals to be found culpable of crimes against humanity under the Rome Statute, they must have had knowledge of the crime. That is, perpetrators must have been aware that their actions formed part of the widespread or systematic attack against the civilian population. While perpetrators need not be identified with a policy or plan underlying the crimes against humanity, they must at least have knowingly taken the risk of participating in the policy or plan. Human Rights Watch’s findings, presented in detail below, show that military commanders and officials in the intelligence agencies gave both direct and standing orders to use lethal force against protesters, as well as to unlawfully arrest, beat, and torture detainees. On many occasions, they were not only present during the commission of the crimes, but personally participated in the violations. In several cases documented by Human Rights Watch, the commanders oversaw the cover-up operations, such as the disposal of dead bodies following the killings. Individuals implicated in such acts bear individual criminal responsibility for crimes against humanity under the Rome Statute. Military commanders and intelligence officials could also bear responsibility for violations committed by units under their command in accordance with the doctrine of command responsibility under the Rome Statute, even if they did not directly participate in or give orders to commit the violations. The Rome Statute stipulates that military commanders bear responsibility for crimes committed by forces under their “effective command and control, or effective authority and control” when they knew or should have known about the crimes and failed to prevent them or to submit the matter for prosecution. The same principle applies to civilian officials for crimes committed by their subordinates that concerned “activities that were within the effective responsibility and control of the superior” when they “knew, or consciously disregarded information which clearly indicated, that the subordinates were committing or about to commit such crimes” and “failed to take all necessary and reasonable measures within his or her power to prevent or repress their commission or to submit the matter to the competent authorities for investigation and prosecution.” A head of state and members of government are not exempt from responsibility. Several examples indicate that President Bashar al-Assad, who is the commander-in-chief of the Syrian armed forces, the heads of intelligence agencies, and other high-ranking officials mentioned in this report have ordered, authorized, or condoned the violent crackdown on protesters. It is also reasonable to assume that they knew about the extent and nature of the repression through official channels. In addition, information about violations committed by the military and security forces since the beginning of protests in Syria has been publicized by several international organizations, including Human Rights Watch, the media, and Syrian activists. Multiple international bodies have raised concerns about these violations as well. The independent commission of inquiry appointed by the Human Rights Council extensively documented the violations and presented its report to the HRC, and the UN General Assembly adopted a resolution condemning the abuses. In these circumstances, the failure to stop the violations and bring their perpetrators to justice also makes these officials criminally responsible under the doctrine of command responsibility. The Rome Statute stipulates that, subject to some exceptions, individuals accused of crimes against humanity cannot avail themselves of the defense of following superior orders. One such exception is if an individual acts under a threat of “imminent death or of continuing or imminent serious bodily harm,” made explicitly or “constituted by other circumstances beyond that person’s control,” if “the person does not intend to cause a greater harm than the one sought to be avoided.” As this report illustrates, many rank-and-file soldiers in the Syrian armed forces and intelligence agencies appear to have acted when faced with the choice of committing the crimes or being killed for disobeying the orders, and, in many cases, they seem to have tried to prevent the worst consequences of their actions—for example, by firing in the air, or aiming at the protesters’ feet to avoid killing them. As mentioned above, Human Rights Watch has documented a number of instances where the protesters resorted to violence, yet these incidents of violence by protesters remained exceptional compared to the number of attacks on protesters we documented. We also asked every military defector interviewed for this report about the use of violence by the protesters, and all but one of them said that they never felt under threat when dealing with protests. Some mentioned that the protesters threw stones at the security forces, one defector mentioned being involved in a shoot-out with armed protesters in Bukamal in the Deir al-Zor governorate, and one defector mentioned that he was aware of a group of protesters in a town in Daraa governorate that was armed, but had not seen it in action. Incidents where protesters have allegedly resorted to violence should be further investigated and in some cases may provide a valid defense against accusations of involvement in crimes against humanity where individuals responded in a manner that was proportionate to the degree of danger. The defectors’ statements, however, support the conclusion that in many cases, the force used against the protesters was clearly disproportionate to the threat presented by the overwhelmingly unarmed crowds. Considering the evidence that crimes against humanity have been committed in Syria, the pervasive climate of impunity for security forces and pro-government militias, and the grave nature of many of their abuses, Human Rights Watch calls on the UN Security Council to refer the situation in Syria to the ICC. Human Rights Watch believes that the ICC is the forum most capable of effectively investigating and prosecuting those bearing the greatest responsibility for serious crimes committed in Syria. Human Rights Watch also recalls that crimes against humanity are considered crimes that trigger universal jurisdiction under international customary law, and thus all states should bring to justice those who have committed them. The Violations Documentation Center, in cooperation with Local Coordination Committees (LCC), a network of Syrian activists documenting and publicizing violations inside Syria, has collected the names of 3,934 people killed by the security forces between the beginning of anti-government protests in March and December 3, 2011. In her statement on December 2, 2011, United Nations High Commissioner for Human Rights Navi Pillay said that more 4,000 people, over 300 of them children, had been killed. Human Rights Watch has documented and publicized many of these killings. Defectors’ statements provide further information about the systematic nature of the killings authorized by commanders of the armed forces and intelligence agencies at the highest levels. All of the military defectors interviewed by Human Rights Watch said that their commanders gave standing orders to “stop the protests at any cost” during regular briefings to the troops and prior to deployment. In many cases, the commanders explicitly authorized the use of lethal force against largely peaceful protesters. In about half of the cases, interviewees said that commanders followed these standing orders with specific orders during the operations against protesters to “open fire,” “shoot,” “kill,” “destroy,” and the like. Human Rights Watch also obtained information about commanders’ involvement in the planning and implementation of specific operations that resulted in a large number of civilian casualties. Further, on several occasions documented by Human Rights Watch, commanders gave orders or participated in the transfer—or burial—of the bodies of protesters killed in attacks during demonstrations. All of the 63 defectors interviewed by Human Rights Watch said that they received standing orders to suppress, stop, or disperse the protests “by all means necessary” prior to deployment. These orders were communicated during regular morning meetings or immediately before deployment to specific areas either directly by high-ranking commanders, or by lower-level commanders referring to orders received from high-ranking commanders. The defectors said that even when it was not specified, they universally understood the phrase “by all means necessary” as an authorization to use lethal force, especially in the light of the fact that they were issued live ammunition as opposed to other means of crowd control. On August 27 we were near a police hospital in Harasta. About 1,500 protesters came there. They requested the release of an injured protester who was inside the hospital. They held olive branches. They had no arms. There were 35 army soldiers and about 50 mukhabarat personnel at the checkpoint. We also had a jeep with a mounted machine-gun. When the protesters were less than 100 meters away, we opened fire. We had previously received the orders to do so from the Brigadier General. Five protesters were hit, and I believe two of them died. We were told to shoot if civilians gathered in groups of more than seven or eight people. Commander of the 154th Regiment Brigadier General Jawbat Ibrahim Safi and divisional commander Major General Mohamed Ali Durgham gave us the orders before we went out. The orders were to shoot at gatherings of protesters as well as defectors, and to storm houses and arrest people. Our orders were to make the demonstrators retreat by all possible means, including by shooting at them. It was a broad order that shooting was allowed. When officers were present they would decide when and whom to shoot. If somebody carried a microphone or a sign, or if demonstrators refused to retreat, we would shoot. We were ordered to fire directly at protesters many times. We had Kalashnikovs and machine guns, and there were snipers on the roofs. Brigadier General Ahmed Yousef Jarad, the brigade commander, gathered us in the yard before we moved out. He told us to stop the people who were rioting by all means necessary. He said that the country needed to be cleaned of the protesters and said we should shoot at anything suspicious. He ordered us to use our PKT machine guns and DShK antiaircraft guns [Russian-made vehicle-mounted weapons] as well. Our general orders were to kill, destroy stores, crush cars in the streets, and arrest people. · “Habib,” an officer with the 65th Brigade, 3rd Division, told Human Rights Watch that his unit received initial orders at a briefing at their base in Douma in mid-March. According to Habib, Major General Naim Jasem Suleiman, the commander of the 3rd Division, and Brigadier General Jihad Mohamed Sultan, the commander of 65th Brigade, told the troops that they would need to fight armed groups “supported by Israel and the US” and that they had one month to stop the protests at any cost. Habib explained that his unit fell under the command of Imad Fahed Al Jasem during the April 25 operation in Daraa. According to Habib, his unit also took orders from Brigadier General Ramadan Mahmoud Ramadan, the commander of the 35th Special Forces Regiment, in addition to the divisional and brigade commanders mentioned above. Just before the operation, Colonel Mohamed Khader gave us about 30 minutes of instructions. As we were entering the town, we were supposed to shoot at anybody who shot at us. But after we entered, our orders were to shoot at anybody we saw, even if they were just sitting on a balcony. · “Salim,” an officer with the 46th Special Forces Regiment deployed to Idlib, said that Major General Fo’ad Hamoudeh, who had assumed command of the Idlib operation, told the forces to “stop the protesters at any cost” in the beginning of September. · “Mohamed,” a soldier with aerial defense unit MD 1010 deployed to Bukamal in the beginning of May, said that the commander of his unit, Colonel Issa Shibani made it clear that the unit’s “job was not to arrest people, but to kill.” According to the soldier, the commander gave verbal orders to “kill anyone putting up resistance, regardless of whether they are men, women, or children.” Mohamed said that 35 to 40 people were killed during the first day of the operation as his unit entered Bukamal. A Special Forces commander Major General Bader Aqel gave the soldiers orders to pick up the bodies and hand them over to the mukhabarat. On paper, it said “Stop the protesters,” but verbally he explicitly said, “Kill.” During normal days, at curfew, every moving object was a target. During the protests, the commanders gave us a specific number, or a percentage, of protesters who should be liquidated. For 5,000 protesters, for example, the target would be 15-20 people. “Ameen” said that two commanders from the 45th Regiment, Brigadier General Ghassan Afif and Brigadier General Mohamed Maaruf, had overall command of the operation in Homs at that time. More than half of the defectors interviewed by Human Rights Watch said that the commanders of their units or other officers gave direct orders on the spot to open fire at protesters or bystanders, and, in some cases, participated in the killings themselves. From the circumstances of the cases, it appears that the commanders should have known that the protesters were unarmed and did not present a significant threat to the soldiers. Most of the defectors said that they tried to avoid killing the protesters, by aiming at their feet or firing in the air, but in some cases did not dare to disobey orders because they thought that they would be killed (see chapter below). A few took up arms against security agents and officers who ordered the killings, and many defected when they realized that they were ordered to shoot at unarmed protesters as opposed to the “armed gangs” they had been told to expect. During the funerals, many people went to their roofs, shouting “Allahu Akbar!” [God is great!]. I heard Colonel Khaddour, who was at our checkpoint at the time, contact Brigadier General Yousef Ismail by radio. Khaddour told us to start firing, saying that anyone shouting “Allahu Akbar” from the rooftops was a terrorist. We were firing at the roofs and houses randomly, from BMPs [tracked armored infantry vehicles] and smaller weapons. The commander gave us orders to shoot at anyone who refused to disperse. The protesters were chanting, “The people and the army are together.” When they approached, the captain gave orders to shoot. We tried to avoid killing people, and shot at their feet; about 20 people were injured. Hisham said that Captain Khaldoun Ghalia alsoverbally“gave orders to shoot right away to make them disperse,” when the company was deployed to disperse a night protest in Qadam neighborhood in Damascus at the beginning of September. Hisham said he saw people falling, but couldn’t tell how many since it was dark. We were all armed, with Kalashnikovs and machine guns. There were thousands of protesters. We started firing in the air, but the protesters wouldn’t disperse. Then Colonel Suheil Hassan gave orders to shoot directly at the protesters. He said, “So, they are challenging us?! Shoot them!” There were people injured and killed. The first time, Colonel Khader and the mukhabarat were just behind us. Khader had given general orders to shoot before the operations. When the protesters started walking toward us, he gave orders to open fire. About a week later, on a Friday, several thousand protesters gathered at the intersection near the airport highway. Our commander called us to come to the square to provide support. He said we had to end the protest by all possible means within an hour, to prevent any media coverage. We used smoke bombs, and people dispersed, but then they gathered again. Then the mukhabarat opened fire. We were shooting as well, but tried to shoot in the air. Seven or eight people were killed, about 30 were injured, and about a hundred detained. · “Hossam,” who served in Air Force Intelligence in Daraa, said that at some point in April, his unit was ordered to enter the Omari mosque in Daraa, which served as a gathering point and makeshift hospital for the protesters. He said that Colonel Majed Darras gave the unit verbal orders to open fire and as a result 12 people were killed. I was ordered to shoot at protesters many times, but I shot in the air since I knew these were ordinary people and not terrorists. Those who directly ordered us to shoot were Colonel Imad Abass and Major Ziyad Abdel Shaddoud. They said that we were fighting terrorist groups and that we had to get rid of them. They told us to kill anybody who was outside in the street without asking who they were. Several thousand protesters had gathered near the stadium in al-Herak in the afternoon on August 7. They started walking towards our checkpoint where we had 150-200 soldiers and security agents. They were shouting, “down with the regime!” but they were not armed—no weapons, rocks, or sticks. There was an imam among the protesters. Brigadier General Mohsin Makhlouf, who was commanding the operation in al-Herak, told the imam that he needed to stop the protesters, but he didn’t, and said that the protesters were peaceful. Then Briagider General Makhlouf and Brigadier General Ali Dawwa ordered us to shoot at the protesters. Some defectors said that unit commanders not only ordered the killings but also killed people themselves. “Afif,” a career officer who used to serve in the Presidential Guard and took part in the protests in Nawa, said that the military brought in a new group of forces, including the 171st Battalion, 112th Brigade, when the protests restarted in the town in the beginning of August. Afif said he saw their commander, Colonel Sami Abdulkarim Ali, fire at the protesters from his Kalashnikov and kill one person, 16-year-old Omran Riad Salman. Human Rights Watch reviewed footage posted on YouTube that purports to show the body of a young man identified as Omran Riad Salman killed on August 3 in Nawa. The majority of the defectors also cited incidents where they received direct orders to open fire from mukhabarat or other officers stationed at the same checkpoints, whose names they often did not know because they were from different units. After the noon prayer, the protesters—about 3,500 people, mostly youth—started approaching. They took off their shirts to show that they were unarmed. When they approached the first checkpoint, soldiers started shooting, some in the air and some, it seemed, in the crowd. There were no warnings, no tear gas. It was mainly the army, and mukhabarat was observing. The army commanders were giving orders, and the mukhabarat was there to ensure that the soldiers followed them. People were approaching from different sides, and one guy came up to me and screamed, “If you are a man, shoot me!” The same moment, a mukhabarat guy next to me shot him in the shoulder, at close range, and tried to arrest him. His mother approached us and said, “Let him go; take me instead!,” and a mukhabarat guy in civilian clothes in front of me shot the guy point blank and killed him, in front of his mother. I don’t know how old the guy was; he looked like a teenager. The protesters managed to take his body away. Our orders were also to shoot at any car that wouldn’t stop. One day, I woke up to the sounds of gunfire, and when I got out, I saw mukhabarat and soldiers firing at a minibus. It was around 3 a.m.; it must have been some kind of emergency. There was a man driving the minibus, and his wife sat next to him holding a child. The minibus stopped, and the woman got out, screaming, “What did you do?! You killed him!” The man was shot in the back, and he was unconscious. There were many bullet holes in the bus, but I saw only one bullet wound on the body. We got a taxi, and sent all three of them off. It was in the end of July, just before Ramadan. It happened in front of me, around lunch time. There was a car that was trying to get away from the protest, and get on the road. It was moving closer to the checkpoint, and a mukhabarat officer said, “Fire!” One guy from my battalion raised his Kalashnikov and shot, and others did too. The car stopped, a man got out of the passenger seat to get the kid who was in the back, and got shot right there. The driver was killed on the spot, and another passenger was also killed. We searched the car for weapons, and didn’t find any, but saw a three-year-old kid in the back. He was alive. We gave the bodies to mukhabarat; they drove them away in a car, and left the boy there. I assume some of the protesters took him away; the protest was winding down at that point. According to information collected by Human Rights Watch, the Syrian security forces have conducted a widespread and systematic campaign of arbitrary arrests and torture of detainees across Syria since the beginning of anti-government protests in March 2011. Information provided by the defectors in this report, many of whom personally participated in arrests and ill-treatment, further corroborates these findings. The defectors described large-scale arbitrary arrests during protests and at checkpoints, as well as “sweep” operations in residential neighborhoods in a number of governorates. Defectors who participated in such operations said that they conducted the arrests either on the basis of lists of wanted individuals that they received from their commanders or more general orders to arrest the protesters or residents of specific neighborhoods. Most of these arrests appear to have been conducted by the intelligence agencies, while the military provided support during the arrest and transportation of detainees. According to the defectors, arrests were routinely accompanied by beatings and other ill-treatment, which the commanders ordered, authorized, or condoned. Those defectors who worked in or had access to detention facilities told Human Rights Watch that they witnessed or participated in the torture of detainees. The number of people arrested since the beginning of the protests is impossible to verify. As of November 23, the VDC had documented more than 15,500 arrests. The real number is likely much higher. A member of the Air Force Intelligence Special Operations branch told Human Rights Watch that he believed the overall number of detainees to be over 100,000, many of whom had been released again, judging by information accessible to him. He said that by the time he defected at the end of August, there were at least 5,000 detainees at the detention facility at his branch alone. Another witness, “Mansour,” who served in Air Force Intelligence in Daraa independently gave Human Rights Watch a similar figure, saying that his branch arrested about 5,000 people during the three months that he served in Daraa (April through June), about 600 of whom were released at different times thereafter. Information from the defectors about sweep operations in which they participated lends some support to the high number of detainees provided by the intelligence officers. As the examples below illustrate, security forces regularly detained dozens of individuals during protests; “sweep” operations, which usually took place following protests or after the army invaded a town, resulted in hundreds of arrests. The raids were often accompanied by looting and destruction of property that interviewees said officers condoned. · “Said,” who was deployed to Talbiseh with the 134th Brigade, 18th Division, said that after the military moved into the town in early May, the mukhabarat and army started conducting daily raids, arresting “anyone older than 14 years, sometimes 20, and sometimes a 100 people.” Said also said that the arrest raids in which he participated, authorized by the mukhabarat and the military, were accompanied by “brazen looting” and burning of shops. · “Bassam,” who served in a civil defense unit that operated under the command of the 18th Division, said that his unit conducted sweep operations in Talbiseh at the beginning of August, which resulted in the arrest of 200 people, including five women, and in Rastan two days later, where they arrested about 300 people. When we broke into a house, we would just crash the door without knocking and detain the men—one, two, sometimes more—randomly. We humiliated them in front of their families. Our group normally included ten mukhabarat guys, shabeeha, and two soldiers. Security and soldiers took TV sets, videos, and other goods. Sometimes, we would steal cars to drive away the loot. In Bayda, we broke the doors and took whatever we wanted. The mukhabarat was arresting people; in one area, they arrested ten old men to force their children to turn themselves in. The same continued in Banyas, where we went the next days. In Basateen, we looted everything, both my unit and others. We always took money, and then whatever was there: gold, mobiles, electronics, and sometimes even women’s clothing. I saw the mukhabarat and some soldiers also touching women inappropriately, pretending to be looking for bombs and explosives. · “Fadi,” a soldier with the 292nd Battalion, Presidential Guard, said that Colonel Murad `Isa gave his unit orders to raid houses in the Mezzeh area in Damascus in mid-April “to extract armed terrorists.” He said the unit provided support to mukhabarat personnel who went inside and arrested about 15 people, none of whom seemed to have weapons. He said that such raids took place every Friday, in Damascus and the suburbs, and resulted in dozens of arrests each time. At dawn, 15 buses with Air Force Intelligence arrived and started raiding houses in Qadam. We manned checkpoints and grabbed anybody who tried to run away. Three of my mom’s cousins, who live in the area, were arrested that night. Several days later, commanders took us to another area, Qabun. There they told us to conduct raids on the houses as well. We had a list of 900 wanted people. We were there for two days, and arrested about 800 people from that neighborhood. We were at checkpoints preventing escapes. Each checkpoint would receive an updated list, so I knew the numbers. For example, “Faysal,” a soldier with the 157th Coastal Guard Battalion, who was based in Latakia, said that his checkpoint, located on the road from Tishreen University to Aleppo, had a list of about 500 people. During the five days that he spent at the checkpoint, they arrested about 200 people. The orders to arrest people, he said, were given by Colonel Hassan Kher Bek. “Ali,” a soldier from the 11th Division based in Hama in June, said that his group, responsible for manning the checkpoints, had a list of about a thousand wanted individuals. Several defectors mentioned that as the number of detainees kept growing, the security forces started running out of space in regular detention facilities, and started turning schools, stadiums, and other locations into ad-hoc detention centers. On an average Friday, we, together with State Security [one of the intelligence agencies], arrested about 50 people, anyone between ages 15 and 50, after the protests. I saw many bribe their way out, but there still wasn’t enough room for all the detainees. We turned many schools and other buildings into detention facilities. The purpose of these arrests was to scare people so that they would not participate in protests anymore, and to make money. Inside the stadium there were Special Forces, but mostly they were intelligence agents. There were four or five senior commanders, brigadier generals, in the stadium as well, but I don’t know their names. It was full of people; they were all close to each other. It was difficult to walk without stepping on somebody. People were brought there in buses, from Daraa and surrounding towns. Defectors from the military and the intelligence agencies who were involved in the arrest operations said that they beat detainees during arrest and transportation to the detention facilities. Some cited specific orders they received from their commanders in this respect. · Lieutenant Colonel “Ghassan,” who was deployed to Douma in March-April, said that Brigadier General Mohamed Khadur, the commander of the 106th Brigade, Presidential Guard, verbally ordered him to beat the protesters with sticks and then arrest them. According to Ghassan, Khadur said he received his orders from Major General Shoaeb Suleiman, commander of the Presidential Guard. There was a protest in the city on the second day of Ramadan [on August 2]. We surrounded the protesters, firing at those who tried to run away, and then started arresting people. We detained about 50 people. I saw our commander, Colonel Essam, personally beat them. He had a camera, and I watched as he demanded that they confess to being terrorists, having weapons, and receiving money from the US and Saad al-Hariri [a former Lebanese prime minister]. Two people agreed. He filmed the confessions, and said he would tell the guards not to torture these two. We had batons, and the shabeeha had weapons; they wore black clothes. We were running after people, and those we grabbed wished they had died because of how badly we beat them. On that day, Captain Mohamed Harb was in charge. He used to shoot with his pistol at those we couldn’t catch. In the morning of April 12 we arrived to Bayda. Our orders were to enter the houses and arrest all males older than 14 years. We raided the houses and took all males to the main square. We beat them, insulted them, laid them on the ground and stepped on them. The orders came from Colonel Mansour, commander of the 230th Battalion, who said he received them from the Brigadier General Ghassan Afif, commander of the 45th Regiment. While most of the defectors were only involved in transporting the detainees to various detention facilities, a few, mainly those who served in the mukhabarat, had first-hand knowledge of the situation inside the facilities. Their statements corroborate the widespread use of torture in detention previously documented by Human Rights Watch and provide additional details on the security officials in charge. · One of the mukhabarat defectors, “Omar,” who worked at the director’s office at the Air Force Intelligence Special Operations branch based in the Mezzeh airport, said that after the Saida operation (see above), Air Force Intelligence officers brought back 160 detainees. Omar was responsible for organizing their transfer to the Investigative Branch of the Air Force Intelligence and thus had access to the name list. He said that the detainees were held at the detention facility at the Mezzeh airport. Eventually all but two of them were released. Omar said these and other detainees whom he saw both during his service and during his detention (see below) were repeatedly tortured in detention at the Mezzeh facility and in two other detention facilities run by Air Force Intelligence, in each of which he spent time. He provided Human Rights Watch with detailed descriptions and sketches of the three facilities and their locations. He said that the methods of torture that he observed used by interrogators at the Mezzeh facility included prolonged beatings with sticks and lashing with whips; suspension of detainees by their hands from the ceiling, at times for hours or even days; use of electric cattle prods and an electroshock machine with wires attached to different parts of detainees’ bodies; as well as food, water, and sleep deprivation. According to Omar, Brigadier General Abdulsalam Fajer Mahmud, as the head of the Investigative Branch of Air Force Intelligence, was in charge of all three detention facilities. On April 1, we were conducting arrests in Mo’adamiyeh neighborhood in Damascus. We received our orders from Colonel Suheil Hassan. He told us explicitly to beat people severely on the heads, and not worry about the consequences. We also used electric cattle prods. The order was communicated verbally, before we got dispatched. We were beating people inside the buses, and then at the detention facility at the base. At the detention facility, we would first put people in the yard, and beat them randomly, without any interrogation. I was involved in escorting prisoners to the yard, and then to the detention facility. That day we arrested about 100 people. We put all of them in a five by five meter cell. My unit was also involved in beating people. My heart was boiling inside, but I couldn’t show it because I knew what would happen to me. From July to September, mukhabarat brought detainees to the camp, usually 10 to 30 people, around 9 or 10 p.m. after every protest (and they happened almost daily). They lined them up, blindfolded, put them on their knees and beat them up. They swore, and put their feet on people’s heads. It was outside, right near my office. They beat them up while waiting for Al Jasem [Imad Fahed Al Jasem, who oversaw the operations in Idlib] to come to inspect the detainees. The mukhabarat also brought young soldiers, including guys from my unit, told them that these detainees were terrorists, and made them beat them. When Al Jasem arrived, he would swear at the detainees for participating in the protests. And then they would take them to a nearby prison. The prison was guarded by the soldiers from my unit, so I sometimes went there. They held the detainees there for a night, in a six by seven meter room, without food or water. Most of them were between 16 and 18 years old, but there were some kids that looked much younger. I asked two boys who looked particularly young when they were born; one said in 1998, and the other said in 2000. I think many kids were caught because they didn’t know how to escape. There were also a few detainees over 60. Some of the detainees were doctors, arrested for helping the wounded. · One of the defectors, “Afif,” a career officer who served for over 20 years in the Presidential Guard, said that he was arrested and tortured by Military Intelligence agents first in Daraa, and then in Damascus, for his role as a protest organizer in Daraa. He said that the people who arrested him in Daraa included Colonel Wafiq Nasseer, Colonel Louai Ali, Colonel Osama Hadj, and Colonel Nadal Abdallah, all of whom he knew personally. After strip-searching and beating him in the Military Intelligence facility in Daraa, intelligence agents transferred him to branch 291 in Damascus where, for eight days, they brutally tortured him with electric shock and prolonged beatings. Afif said that although he was blindfolded all the time he was held at branch 291, he recognized (by their voices and by asking them directly) two of the interrogators who tortured him as Brigadier General Salah Hamoud and Colonel Asef Dakkar, both of whom he knew from the time he served in the Presidential Guard. Afif said that toward the end of his detention the director of Military Intelligence Abdul Fatah Kudsiyeh interrogated him and, unsuccessfully, tried to get him to cooperate with the authorities. Afif also said that he was arrested for a second time during the military offensive in Nawa in April. He said that together with about 5,000 other detainees he was brought to the Military Intelligence base near Nawa where Colonel Nadal Abdallah personally beat him and other detainees. One of the most worrisome features of the intensifying crackdown on protesters in Syria has been the growing number of custodial deaths since the beginning of July. Local activists have reported more than 197 deaths in custody. Human Rights Watch has previously documented many such cases, specifically in Daraa and Homs governorates. Two defectors interviewed by Human Rights Watch shared information about the summary executions of detainees or deaths from torture in detention in Bukamal and Douma. One of the cases allegedly involved up to 17 deaths. They had weapons, shotguns, and there was an exchange of fire for about ten minutes, but nobody was injured. Then we blocked the entrances, and the mukhabarat’s anti-terrorism unit went in. The men surrendered, and the mukhabarat hand-cuffed them, dragged them out into the school yard, and started beating them. Then they took them away, I didn’t know to where. Then, six or seven days later, an ice-cream truck came to our base bringing 17 bodies. Military Intelligence agents brought the bodies and told our commander to take care of them. Our commander ordered us to bring the bodies to the town square and dump them there. Some of the bodies were in bags, others not. Suddenly, we recognized some of the faces. Somebody said, “Oh, remember! These are the guys from the school.” The bodies that I could see looked like they’d been dead for a few days, all stiff, and the blood was dry. They were fully naked, with traces from handcuffs and, dried blood on their heads and chests. Some seemed to have bullet wounds, but it was hard to tell, and they had holes that looked like they were drilled on their arms, legs, and shoulders. I don’t know whether all of the 17 were there, but I recognized quite a few of them. Seven soldiers were beating the man whom they had arrested. When I came, he was still alive. He was screaming, and the soldiers were swearing and laughing. It lasted for about five minutes longer, and then he died. He stopped moving, and I saw blood coming out of his mouth. When I took over, I informed Khadur [commander of 106th brigade of the Presidential Guard Brigadier General Mohamed Khadur] that we had a fatality. He ordered us to leave the checkpoint and the body behind. We went back to headquarters. Somebody must have picked up the body. People saw us coming out of that building. Ghassan said that to his knowledge, despite reporting the death in custody to Khadur, there has been no investigation of the incident. Military defectors also provided further information about the denial of medical assistance to wounded protesters, use of ambulances to arrest the injured, and the mistreatment of injured detainees in hospitals controlled by the mukhabarat and the military—a disturbing pattern that Human Rights Watch and other organizations have previously documented. Several examples cited by the defectors strongly suggest that these violations were ordered, authorized, or condoned by commanders rather than committed at the initiative of individual members of the armed forces or security services. The Martyrs’ Road where the protesters always went was considered a high-tension area. State Security gave me an ambulance to move around. They confiscated the ambulances to make sure they were not available to pick up wounded protesters. It also made it much easier to arrest people initially, until the protesters realized that the ambulances were used by security services and started running away. Since the people could not use the ambulances, they would pick up the wounded in private cars. When I was manning checkpoints, we specifically looked for such cars. If there was a wounded person in a car, or even traces of blood, we would immediately arrest everybody in the car. Another witness, “Munir”, who served in the 409th Battalion, 154th Regiment, 4th Division, and was deployed in Damascus and its suburbs, also said that the army used ambulances “all the time” to detain people instead of providing them medical assistance. We brought them to the yard at the facility and beat them, including the ones who were wounded. We had a doctor in the branch who was treating them to stop the bleeding and the like. Somebody would say, “Take this one to the doctor,” and as they walked to the other side of the yard, where the doctor was, we beat them. And then we took the detainees to the detention facility. Injured protesters who were brought to the military, or military-controlled, hospitals were also subjected to mistreatment and beatings by security agents and hospital staff. Those whose wounds were serious and did not allow for immediate transportation were held in temporary detention facilities on hospital premises before being transferred to other places of detention. Mukhabarat and the army brought the injured and unloaded them in the yard next to the emergency area. Everybody would start beating them, including doctors and nurses. All the detainees were blindfolded. After the initial beating in the yard, the nurses and guards took the wounded into the emergency room, provided them some basic assistance, and then the mukhabarat took them. They first held them in a detention facility on the premises for a few days; the army police was in charge of it. Then Air Force Intelligence took them away in their cars. That was the case with every single injured person brought to the hospital. I think people were tortured in the detention facility because I regularly heard their screams. People with serious wounds were taken to intensive care and guarded there by army police. Sometimes, soldiers would go in there and I heard people screaming; I think they were beating them inside there. Colonel Dr. Haitham Othman was in charge of the hospital. The chief doctor in the hospital was trying to tell him and the mukhabarat not to torture people because the hospital’s job was to treat people and not to torture them, but everybody just ignored him. We were not supposed to allow any family members in. When relatives asked at the gate, we told them that this was an army hospital and it didn’t have any civilians. They had TV cameras in the hospital almost every day. The crew filmed the wounded, but didn’t interview them, and then they commented that people had been attacked by armed gangs. Civilians weren’t getting proper treatment. They were essentially under arrest in the hospital. And they were denied medical care. At some point, an old man came with his son who was wounded. The old man was shouting, trying to get help for his son. Instead, security guards took him to a room and beat him; when he came out, his head was bleeding. As mentioned above, in addition to individual responsibility in cases where they ordered or directly participated in the abuses, senior military commanders and high-ranking officials in some cases bear command responsibility for violations committed by forces or subordinates. Specifically, they are responsible in cases where they knew or should have known of the abuses and failed to take action to stop them. Given the widespread nature of killings and other crimes committed in Syria and the fact that in many cases, as this report illustrates, these crimes were ordered, authorized, or condoned by mid- and senior-level commanders, it is reasonable to conclude that the senior military and civilian leadership knew or should have known about them. The extensive documentation of the violations publicized by human rights organizations, the media, and the United Nations makes it even harder to argue that the authorities were not informed. As for action taken to stop the violations, Human Rights Watch is not aware of any meaningful steps taken by the Syrian leadership in this regard. Moreover, in a number of cases documented in this report, military commanders clearly disregarded reports of abuse, let alone took adequate action to address them. In the case of President Bashar al-Assad, who is the commander-in-chief of Syrian army, and his close associates, including heads of intelligence agencies and military leadership, Human Rights Watch collected additional information that strongly indicates their knowledge and involvement in the violent crackdown on protesters. In August, the British newspaper The Daily Telegraph published two written orders that were signed by the Minister of Defense on behalf of the President in his capacity as commander-in-chief of the armed forces. In the orders, signed on April 23, 2011, The Minister of Defense placed the 4th Division “on high alert,” and deployed the 62nd Battalion, 47th Regiment to Daraa. While it is not known whether President al-Assad directly authorized these operations, the fact that his authority was invoked is further proof that he knew, or at the very least, should have known about them. A mukhabarat defector, “Omar,” who was an assistant in the director’s office at the Air Force Intelligence Special Operations branch in Damascus, told Human Rights Watch about the planning of the operation in Saida, one of the bloodiest massacres since the beginning of the protests, which, according to him, was authorized by Major GeneralJamil Hassan, the director of Air Force Intelligence. VDC was able to document 98 deaths in Daraa on April 29 and 30 as a result of the operation, and Omar believed that 120 people were killed. Colonel Suheil Hassan, my boss at the Special Operations unit consulted with his deputy, Fawaz Qubair, and they agreed to organize a “trap” for the protesters near the military housing in Saida. The conversation took place in the office where I worked. They also discussed their line with the media: that people marching to Daraa were Islamists coming to kidnap women and children in predominantly Christian areas. I then saw Suheil call Major GeneralJamil Hassan, the director of Air Force Intelligence, to get his approval for the mission. He has a designated line to Hassan, and he used that phone. I couldn’t hear what Hassan said, but I assume he approved the mission, because shortly thereafter, troops started leaving our base in Mezzeh for Daraa. Omar said that when the troops returned that evening, they brought 120 bodies of killed protesters back to the base, as well as 160 detainees. He said that he saw the troops unloading the bodies from the buses and asked one of the soldiers how many they were. Suheil Hassan, he said, later told him to arrange a convoy to accompany the trucks with the bodies back to Daraa. Human Rights Watch also collected extensive information about the participation of specific military units and intelligence agencies in attacks against the protesters in different cities and large-scale military operations that resulted in killings, massive arrests, torture, and other violations. This information is summarized in the appendix to this report, which contains details on the structure of the units, locations where they were deployed, violations in which they were allegedly involved, and, wherever this information was available, the names of their commanders or officials in charge. Human Rights Watch believes that, in addition to military and mukhabarat officers mentioned in connection with specific incidents in this report, these commanders, including the highest-ranking officers and heads of intelligence agencies, should be investigated on the grounds of their command responsibility for violations committed by units under their control. Consequences for disobeying orders and challenging government allegations about the protests were severe. Eight defectors told Human Rights Watch that they had witnessed officers or intelligence agents kill soldiers for refusing to carry out orders. Three defectors interviewed by Human Rights Watch said that they had been arrested and tortured for disobedience, and one defector said that a close relative had been arrested as a means of putting pressure on him to return to his unit. There are no comprehensive numbers about the numbers of soldiers killed for refusing to carry out illegal orders. Virtually all defectors interviewed by Human Rights Watch said that they were convinced that officers or intelligence agents would kill them if they refused to follow orders. In standard operations to suppress protests, conscript soldiers from the army or intelligence agencies lined up in front, while officers and intelligence agents stayed behind, giving orders and making sure they followed orders. Many of the defectors said that they tried to aim above the heads of the protesters when they received orders to shoot, but that they were always afraid that the officers or the security agents would notice. Several defectors also told Human Rights Watch that snipers on rooftops targeted both protesters and soldiers who disobeyed their orders. “Ameen,” a sniper interviewed by Human Rights Watch, confirmed that he had received orders to target defectors. On several occasions, officers and intelligence agents explicitly threatened soldiers that they would be killed if they did not follow orders. A tank operator from the 132nd Brigade, 5th Division, based in Daraa, told Human Rights Watch that before the April 25 operation in Daraa the brigade commander, Brigadier General Ahmed Yousef Jarad, threatened that anybody showing sympathy with the protesters would be shot and treated as a traitor. The tank operator, who was communicating with commanding officers over the radio and heard orders given to other units as well, said that during the operation, high-ranking officers sometimes threatened tank crews with execution, and that he heard on the radio that several soldiers had been executed in the Daraa stadium on April 25. Eight defectors told Human Rights Watch that they witnessed officers or intelligence agents killing soldiers who refused to follow orders. The soldiers were in front. Colonel Khader and the security agents were standing right behind us. Yusuf Musa Krad, a 21-year-old conscript from Daraa, was standing right next to me. At some point the colonel noticed that Yusuf was only shooting in the air. He told First Lieutenant Jihad from the regional branch of Military Intelligence. They were always together. Jihad called a sniper on the roof, pointed at Yusuf, and the sniper then shot Yusuf twice in the head. Intelligence agents took Yusuf’s body away. The next day we saw Yusuf’s body on TV. They said that he had been killed by terrorists. There were about 100 soldiers in the front row. Fifteen to twenty meters behind us stood agents from Air Force Intelligence. When we received the orders to shoot at the protesters, some of the soldiers started shooting in the air while others were shooting directly at the protesters. A couple of soldiers dropped their guns, refusing to shoot. Suddenly, agents from Air Force Intelligence opened fire on those who dropped their weapons, killing at least three soldiers from Brigade 52. I don’t know their names. When I saw that, I took my gun, ran away, and started shooting at the security agents. When they ordered us to shoot at the protesters, we initially refused, but then they pointed their guns at us, and we couldn’t refuse. One soldier from Hama was standing next to me. He had finished his ammunition so he had stopped shooting while he waited for more. Suddenly somebody from Air Force Intelligence shot him in the stomach and he died on the spot. On April 21, a sniper opened fire on soldiers in Douma, according to an officer interviewed by Human Rights Watch. “Ghassan,” a lieutenant colonel in the 106th Brigade, Presidential Guard, told Human Rights Watch that on that day, his unit suddenly took fire at their checkpoint at the Martyrs’ Roundabout. According to the lieutenant colonel, the fire came from an area behind them that had already been secured, and two people from the 104th Brigade were killed. Following the direction of the shooting, the lieutenant colonel went up to the roof of a building where he found a sniper who had previously served in his unit. According to the lieutenant colonel, the sniper said that he had received orders to fire at the soldiers who refused to shoot at protesters, but that he was trying not to hit soldiers from the 106th Brigade, his former unit. “Bilal” told the colonel that the protesters were just chanting. Why should he shoot at them? They got into an argument. An intelligence agent standing nearby, Ahmed Diba, heard the argument. He gave an order on the radio, and suddenly the soldier was shot in the head. They told us that he was killed by protesters, but the sniper, whom we knew, told us that he had received the orders from Diba. Sometime later, Diba warned me that I should stop telling my crew to shoot in the air unless I wanted to suffer the same fate as Bilal. We knew that if we refused to shoot, we would be killed. Intelligence agents were behind us at the checkpoint. When my friend, Yousef Khad, questioned the orders to shoot at the protesters, an Air Force Intelligence agent shot him from the back. Some soldiers opened fire on the intelligence agents, and another three soldiers from another battalion were killed. The agents were not hurt; they were hiding behind the tanks. We all got very scared after that, so we started shooting at the protesters, trying not to aim at people. We saw him take position, but we were told to leave him alone, that he was a intelligence agent. The officers were still discussing. I went to speak with my friends. Suddenly, there were shots. The sound came from the gunman on the roof. The brigadier general said “See, there are armed groups!” We then started shooting. About 40 people were killed. The army collected the bodies and handed them over to Military Intelligence. Three defectors told Human Rights Watch that they had been detained because they refused to follow orders or challenged government propaganda. Two of them said that security forces beat and tortured them. Other defectors interviewed by Human Rights Watch also said they were detained and tortured as a result of participating in protests during leave or before they started their military service. The defectors interviewed by Human Rights Watch were detained for relatively short terms in detention centers on their base or in detention facilities relatively close to their base. Other defectors, according to witnesses, were sent to the notorious Tadmor military prison in Homs governorate. We gave all new arrivals a “reception party” to humiliate them. We blindfolded them for five to six days, verbally abused them, and beat them up using the tire method [forcing the detainee’s legs and arms through a tire and beating him on the soles of his feet]. Then, depending on the crimes, we subjected some prisoners to other methods as well. The shabeh [protracted suspension by the hands] and solitary confinement were reserved for special crimes. When the protests started, we also received rechargeable electrical sticks, which would send shocks with the click of a button. We used all the methods against defectors. We didn’t care whether they were from Assad’s 4th Division or a regular division. We tortured them to show them that nobody is above the law and so that they would learn their lesson. Our commander approached me and asked me why I was not shooting. I told him that I would not kill another human being for him or for Assad. About half of the soldiers from my unit, some 30 people, mainly the older guys, said the same. We outnumbered the security agents, so there wasn’t much they could do. Eventually, they took us back to the base. We were in a hallway, about three meters wide and very long. There was blood on the walls, and it smelled horribly. It felt like a slaughter house. They made us take off all of our clothes, leaving us completely naked, and pushed us into a room that was about three by four meters. They poured water on us and turned up the air conditioner. It was freezing cold, and there was no light. On the second or third day, they took me out of the cell and put me in a cell that was hanging above the floor in the corridor. I could hardly fit into it. I spent the rest of my time in detention – about ten or 11 days in total – in that cage. The first thing I saw were ten bodies, piled on top of each other, in military uniforms with insignia from the 4th Division. The blood on the bodies seemed fresh. Most had bullet wounds to their heads and backs. A guy in the office said that that’s what would happen to us if we didn’t shoot, adding that we needed to protect our country because Mossad is coming to take it over. When they were brought back to the checkpoint and again asked to shoot at protesters ten days later, Wassim defected. They hit me all the time. They used the tire method, threw cold water on me, and hit me on the soles of my feet while holding my legs up. The brigade officers gave the orders, and the regular soldiers carried them out. After they released me, I defected. A lieutenant colonel in the 106th Brigade of the Presidential Guard told Human Rights Watch that he spent six days in prison because he refused to pass on orders aimed at giving the impression that protesters were armed for the benefit of a TV crew that was filming. Most of the defectors expressed concern about the safety of their relatives, and many said that military or security forces had visited their close relatives to inquire about their whereabouts. In one case documented by Human Rights Watch, the defector’s family has faced serious repercussions. A couple of days after I defected, somebody detained my brother from our house in Tseel. My father, sisters, and sister-in-law were at home when he was detained. Shortly thereafter, Colonel Fayez Asmander, my battalion commander, called my father and said that they would release my brother if I turned myself in. This was in the beginning of September. We still don’t know where my brother is. The LCC has documented the detention, torture, and death in custody of relatives of two defectors. The Syrian government’s response to credible accusations of human rights violations has been inadequate and has fostered a climate of impunity, including for unlawful killings, torture, enforced disappearance, and arbitrary detention. Syrian law and a recent presidential decree prohibit legal action against intelligence agency employees or members of the armed forces unless authorized by the respective director of these agencies. Legislative Decree No. 14, of January 15, 1969, which established the General Intelligence Directorate (Idarat al-Mukhabaraat al-`Ama), one of Syria’s largest security apparatuses, provides that “no legal action may be taken against any employee of General Intelligence for crimes committed while carrying out their designated duties … except by an order issued by the Director.” To Human Rights Watch’s knowledge, the Director of General Intelligence has never issued any such order to date. On September 30, 2008, President al-Assad issued Legislative Decree 69, which extended this immunity to members of other security forces, by requiring a decree from the General Command of the Army and Armed Forces to prosecute any member of the internal security forces, Political Security, and customs police. Concerns regarding impunity for violations by security services are longstanding. Human Rights Watch has extensively documented the lengthy record of abuses by Syrian security and intelligence forces during President al-Assad’s decade-long tenure, including widespread torture of detainees, and has found no evidence that the authorities have ever investigated or prosecuted any member of these forces. On March 31, 2011, amid growing concerns about civilian casualties and other human rights violations, the Syrian government established a judicial committee to “launch an immediate investigation into all fatalities or injuries sustained by civilians and military personnel and into all other related offences and to deal with complaints in that connection.” Aside from summary statements by President al-Assad that the work of the Committee is ongoing and that some individuals have been arrested and are being investigated,little is known about it. Questions remain regarding the scope, methodology, and independence of the Committee. Its efficacy remains in doubt, particularly given the legislative immunities in place, and overwhelming evidence of continuing widespread abuse by the security forces. Further, in October he issued a decree establishing a national commission tasked with preparing a draft constitution within four months which will reportedly then be voted on by Syrians via a public referendum. These reforms, however, continue to be undermined by the ongoing repression and violence accompanying security operations and do not touch on concerns regarding impunity for violations by security services. While many states have condemned Syria’s use of violence and some have followed those words with actions aimed at pushing the Syrian government to change course, the international community has been slow to take collective action. Most notably, in October, 2011, Russia and China vetoed a European-sponsored UN Security Council resolution condemning the violence. On November 12, however, the League of Arab States voted to suspend Syria’s membership in the league after Syria failed to honor a November 2 agreement to withdraw its armed forces from cities and towns, release all those detained during the uprising, and allow unhindered access to the country for journalists. Subsequent efforts by the league to deploy monitors to Syria have failed, as of this writing, because the Syrian authorities posed restrictive conditions unacceptable to the league. The league officially suspended Syria on November 16, and on November 27, the league adopted unprecedented sanctions against Syria. The sanctions include cutting off transactions with the Syrian central bank, halting funding by Arab governments for projects in Syria, a ban on senior Syrian officials travelling to other Arab countries, and a freeze on assets related to President Bashar al-Assad's government. More concerted action emerged most recently also from the General Assembly of the United Nations. On November 23, the assembly’s human rights committee adopted a resolution condemning Syria for its use of violence against protesters. The resolution was adopted with 122 votes in favor, 13 against and 41 abstentions. Notably, Russia and China, which vetoed the Security Council resolution in October, abstained. On December 2, the UN Human Rights Council held a special session on Syria following the report of the independent international Commission of Inquiry, a body appointed by the council, which concluded that Syrian security and military forces "committed crimes against humanity" against civilians. The Human Rights Council, in a 37-4 vote, adopted a resolution which strongly condemned “the continued widespread, systematic and gross violations of human rights and fundamental freedoms by the Syrian authorities, such as arbitrary executions, excessive use of force and the killing and persecution of protesters, human rights defenders and journalists, arbitrary detention, enforced disappearances, torture and ill-treatment, including against children." The resolution demanded an immediate end to the violence, the release of all political prisoners, and the suspension of members of the security forces suspected of abuses. Russia and China were among just four countries to vote against the resolution. During the special session, both the UN High Commissioner for Human Rights and all the UN Special Procedures mandate-holders, in a joint statement, called on the UN Security Council to refer the situation in Syria to the ICC. Under the principle of universal jurisdiction and in accordance with national laws, investigate and prosecute members of the Syrian senior military and civilian leadership suspected of committing grave crimes as part of their involvement in the suppression of protests. Should the Security Council be deadlocked, adopt an additional resolution to condemn the violence, demand that Syria cooperate with the UN Commission of Inquiry as well as the Arab League monitoring mission, and urge the Security Council to take action. Remain seized of the situation in Syria as long as widespread human rights abuses continue. Call for the Security Council to adopt a resolution supporting Arab League efforts on Syria. Adopt targeted sanctions on officials credibly implicated in the ongoing grave, widespread, and systematic violations of international human rights law in Syria since mid-March 2011. Support the Arab League’s efforts to deploy monitors to Syria and urge the Syrian authorities to unconditionally facilitate such a monitoring mission. Grant unhindered access to Syria to Arab League monitors, international and regional media, and independent observers, to freely monitor and report on developments and human rights abuses in the country. Sarah Leah Whitson, Middle East and North Africa director, Clive Baldwin, senior legal advisor, and Tom Porteous, deputy program director, edited the report. Balkees Jarrah, counsel for the International Justice program, Geraldine Matioli-Zeltner, advocacy director for the International Justice program, Priyanka Mothaparthy, researcher with the Children’s Rights Division, and Mark Hiznay, senior researcher with the Arms Division provided specialist review. This report was prepared for production by Vikram Shah, associate in the emergencies division; Grace Choi, publications director; Anna Lopriore, creative manager; and Fitzroy Hepkins, production manager. Amr Khairy coordinated Arabic translation; Igor Gerbich provided Russian translation. The information below has been compiled on the basis of defectors’ statements. To the extent possible, the information has been verified through third parties and public sources. Given limitations on access to Syria and official government sources, the information below might be expanded and clarified based on further research. Information provided on individuals below identifies their role within the structure of the Syrian Armed Forces or Intelligence Agencies. Not all individuals listed below also appear in the body of the report. References to specific allegations refer to the units involved. Minister of Defense (from August 8); before that served as Army Chief of Staff. Maher al-Assad (brother of President al-Assad and de facto commander of 4th Division). In theory, the National Security Bureau oversees the four intelligence agencies. In practice, however, the agencies operate with a high degree of autonomy, answerable mainly to President Bashar al-Assad. Given the secretive nature of the Syrian intelligence agencies, it is very difficult to verify information about their structure and commanders. The information below has been included only when confirmed by two or more defectors. Nevertheless, the exact structure of the agencies and the identity of their commanders might be clarified as more information comes to light. The four main intelligence agencies have regional branches in the governorates and main cities, in addition to central branches. All of the main intelligence agencies have been implicated in the killing of unarmed protesters and the arbitrary arrest and torture of detainees. Officer from Damascus; sent to Daraa at the beginning of protests to oversee operations there. For a more detailed overview of the launch of the protest movement and the government’s reaction, see Human Rights Watch, “We’ve Never Seen Such Horror”: Crimes against Humanity by Syrian Security Forces, June 1, 2011, http://www.hrw.org/reports/2011/06/01/we-ve-never-seen-such-horror-0, Section I. Ibid. ; Human Rights Watch, “We Live as in War”: Crackdown on Protesters in the Governorate of Homs, Syria, November 11, 2011, http://www.hrw.org/reports/2011/11/11/we-live-war-0; “Syria: Security Forces Remove Wounded From Hospital,” Human Rights watch news release, September 8, 2011, http://www.hrw.org/news/2011/09/08/syria-security-forces-remove-wounded-hospital; “Syria: Red Crescent Workers Under Attack,” Human Rights Watch news release, September 14, 2011, http://www.hrw.org/news/2011/09/14/syria-red-crescent-workers-under-attack. Syrian opposition groups maintain and regularly update a list of individuals killed in Syria on the Violations Documentation Center (VDC) website http://www.vdc-sy.org/. The Syrian authorities have not published a list of people killed to date. In its statistics, the Violations Documentation Center uses the term “civilians” to describe protesters and bystanders as opposed to defectors and members of the security forces. “Syria unrest: Medvedev urges Assad to reform or go,” BBC News, October 7, 2011, http://www.bbc.co.uk/news/world-middle-east-15218727 (accessed October 7, 2011). Hala Jaber, “Strike Syria and the world will shake; Syria's president tells The Sunday Times that violence is the fault of armed gangs and the Arab League is a stooge of the West,” The Sunday Times, November 20, 2011, http://www.dp-news.com/en/detail.aspx?articleid=103707 (accessed November 27, 2011). Human Rights Watch, “We’ve Never Seen Such Horror,” p. 27. 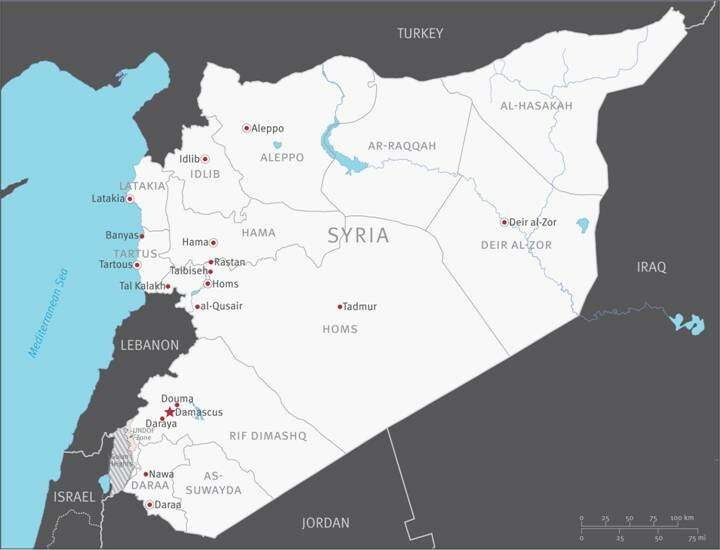 A recent report by the International Crisis Group commented that the “Free Syrian Army itself is more of a wild card than a known entity.” International Crisis Group, “Uncharted Waters: Thinking Through Syria's Dynamics,” Middle East Briefing No. 31, November 24, 2011, http://www.crisisgroup.org/~/media/Files/Middle%20East%20North%20Africa/Iraq%20Syria%20Lebanon/Syria/B031%20Uncharted%20Waters%20-%20Thinking%20Through%20Syrias%20Dynamics.pdf (accessed November 24, 2011). The highest profile attack attributed to the Free Syrian Army was a November 16 attack on an Air Force Intelligence building in Harasta. The details of the attack remain murky. One Western diplomat residing in Damascus told Human Rights Watch that reports of a large-scale attack were overblown. Human Rights Watch interview (name withheld), Beirut, November 24, 2011. İpek Yezdani, “Dissidents from Syria Reveal Action Strategy,” Hürriyet Daily News , November 30, 2011, http://www.hurriyetdailynews.com/Default.aspx?PageID=238&nID=8200&NewsCatID=338 (accessed December 5, 2011) ; “Syrian opposition to co-ordinate with Free Syrian Army,” BBC News, December 1, 2011, http://www.bbc.co.uk/news/world-europe-15984682 (accessed December 5, 2011). For media accounts, see, for example, Anthony Shadid, “Sectarian Strife in City Bodes Ill for All of Syria,” The New York Times, November 19, 2011, http://www.nytimes.com/2011/11/20/world/middleeast/in-homs-syria-sectarian-battles-stir-fears-of-civil-war.html (accessed November 25, 2011); Nir Rosen, “A Tale of Two Villages,” October 24, 2011, http://www.aljazeera.com/indepth/features/2011/10/2011102365913224161.html (accessed November 25, 2011); “Homs, a Syrian City Ripped Apart by Sectarian Killing,” Agence France-Presse in Al Arabiya News, November 26, 2011, http://english.alarabiya.net/articles/2011/11/26/179278.html (accessed December 5, 2011). Nada Bakri, “U.N. Says Action Needed to Prevent Civil War in Syria,” The New York Times, December 2, 2011, http://www.nytimes.com/2011/12/03/world/middleeast/un-says-action-needed-to-prevent-civil-war-in-syria.html (accessed December 5, 2011). See, for example, “Syria: Targeted Arrests of Activists across Country,” Human Rights Watch news release, May 15, 2011, http://www.hrw.org/news/2011/05/15/syria-targeted-arrests-activists-across-country. See, for example, “Syria: Mass Arrest Campaign Intensifies,” Human Rights Watch news release, July 20, 2011, http://www.hrw.org/news/2011/07/20/syria-mass-arrest-campaign-intensifies; “Syria: Shootings, Arrests Follow Hama Protest,” Human Rights Watch news release, July 6, 2011, http://www.hrw.org/news/2011/07/06/syria-shootings-arrests-follow-hama-protest. The International Convention for the Protection of All Persons from Enforced Disappearance (Doc.A/61/488. C.N.737.2008.TREATIES-12 of October 2, 2008) defines an enforced disappearance as: “the arrest, detention, abduction or any other form of deprivation of liberty by agents of the State or by persons or groups of persons acting with the authorization, support or acquiescence of the State, followed by a refusal to acknowledge the deprivation of liberty or by concealment of the fate or whereabouts of the disappeared person, which place such a person outside the protection of the law” (Article 2). Article 1 of the Convention provides: “No exceptional circumstances whatsoever, whether a state of war or a threat of war, internal political instability or any other public emergency, may be invoked as a justification for enforced disappearance.” International Convention for the Protection of All Persons from Enforced Disappearance, Doc. A/61/488, December 20, 2006, entered into force December 23, 2010. For the purposes of a crime against humanity under the Rome Statute of the International Criminal Court (A/CONF. 183/9), Article 7 (2) ()(i) defines enforced disappearance as " the arrest, detention or abduction of persons by, or with the authorization, support or acquiescence of, a State or a political organization, followed by a refusal to acknowledge that deprivation of freedom or to give information on the fate or whereabouts of those persons, with the intention of removing them from the protection of the law for a prolonged period of time.” Rome Statute of the International Criminal Court (Rome Statute), A/CONF.183/9, July 17, 1998, entered into force July 1, 2002, art. 7(2)(i). Human Rights Watch, “We’ve Never Seen Such Horror,” p. 34; “Syria: Rampant Torture of Protesters,” Human Rights Watch news release, April 15, 2011, http://www.hrw.org/news/2011/04/15/syria-rampant-torture-protesters. Human Rights Watch, “We’ve Never Seen Such Horror,” p. 44. See “Syria’s Intelligence Services: A Primer,” Middle East Intelligence Bulletin, July 1, 2000, http://www.intelpage.info/forum/viewtopic.php?t=588 (accessed October 1, 2009); and Middle East Watch (now Human Rights Watch/MENA), Syria Unmasked: The Suppression of Human Rights by the Asad Regime (New Haven: Yale University Press, 1991), pp. 48-51. The Air Force Intelligence Directorate is only nominally tied to the air force. Its role as a powerful and feared intelligence agency in Syria comes from the fact that the late President Hafez al-Assad was once the air force commander, and later turned the air force intelligence service into his personal action bureau. Nominally, the General Intelligence Directorate and Political Security Directorate are “civilian” agencies and under the jurisdiction of the Ministry of Interior, but in practice they are both autonomous entities. Military Intelligence and Air Force Intelligence nominally report to the Ministry of Defense, but again, in practice, are autonomous entities. See “Syria’s Intelligence Services: A Primer,” Middle East Intelligence Bulletin, http://www.intelpage.info/forum/viewtopic.php?t=588; Ahed Al Hendi, “The Structure of Syria’s Repression,” Foreign Affairs, May 3, 2011, http://www.foreignaffairs.com/articles/67823/ahed-al-hendi/the-structure-of-syrias-repression?page=show (noting that “However structured they are in theory, the security agencies are dominated by the Assad family in practice”); Shmuel Bar, “Bashar’s Syria: The Regime and its Strategic Worldview,” 2006, http://www.herzliyaconference.org/_Uploads/2590Bashars.pdf (accessed December 5, 2011)(noting that the heads of the various security organs “answer to the president directly in all matters”); Human Rights Watch, Syria Unmasked, p. 40. Immigration and Refugee Board of Canada, “Syria: Compulsory military service, including age limit for performing service; penalties for evasion; occasions where proof of military service status is required; whether the government can recall individuals who have already completed their compulsory military service,” SYR102395.E, March 8, 2007, SYR102395.E, available at: http://www.unhcr.org/refworld/docid/47d6547928.html (accessed 26 November 26, 2011). For media accounts, see for example, Elizabeth A. Kennedy and Zeina Karam, “Army defectors threaten to transform Syrian uprising into civil war,” The Associated Press, November 21, 2011, http://www.msnbc.msn.com/id/45390188/ns/world_news-mideast_n_africa/#.TtDxlXLhez1 (accessed November 26, 2011); Alexandra Sandels, “Syria military defectors taking active role in revolt,” Los Angeles Times, November 17, 2011, http://articles.latimes.com/2011/nov/17/world/la-fg-syria-rebel-army-20111118 (accessed November 26, 2011); “Syria Faces Growing Pressure As Bloodshed Spikes,” National Public Radio, November 15, 2011, http://www.npr.org/2011/11/15/142364563/syria-faces-growing-pressure-as-bloodshed-spikes (accessed November 26, 2011). Erika Solomon, “Feature – Syria Army Rebels Fight from the Shadows,” Reuters, November 23, 2011, http://in.reuters.com/article/2011/11/23/idINIndia-60691920111123 (accessed November 27, 2011). Human Rights Watch interview, November 5, 2011. Human Rights Watch interview with “Imad,” November 5, 2011. Human Rights Watch interview with “Wassim,” October 27, 2011. Human Rights Watch interview with “Mu`awiya,” June 15, 2011. Human Rights Watch interview with “Louai,” June 21, 2011. Human Rights Watch interview with “Sarmir,” July 25, 2011. Human Rights Watch interview with “Yasir,” July 28, 2011. Human Rights Watch interview with “Habib,” October 31, 2011. “UN Human Rights Council strongly condemns abuses by Syrian authorities,” UN News Centre, December 2, 2011, http://www.un.org/apps/news/story.asp?NewsID=40596&Cr=Syria&Cr1 (accessed December 4, 2011). See Local Coordination Committees, “Human Rights Violations Committed by the Syrian Regime, 15 March – 15 October,” November 7, 2011 (listing 161 detainees who died in custody), “Human Rights Violations Committed by the Syrian Regime, 16 October – 31 October,” undated, (listing 19 detainees who died in detention), and “The Syrian Regime’s Violations File Covering the Period November 1-15, 2011,” undated (listing 17 detainees who died in custody), http://www.lccsyria.org (accessed December 5, 2011). Rome Statute of the International Criminal Court, U.N. Doc. A/CONF.183/9, July 17, 1998, entered into force July 1, 2002. Rome Statute. Syria has signed, although not ratified, the Rome Statute and so is obliged to refrain from acts that would ‘defeat the object and purpose of [the] treaty’. See Article 18 of the Vienna Convention on the Law of Treaties, 1969, United Nations, Treaty Series, vol. 1155, p. 331, acceded to by Syria in 1970. Syria signed the Rome Statute on November 29, 2000. UN Human Rights Council, “Report of the independent international commission of inquiry on the Syrian Arab Republic,” A/HRC/S-17/2/Add.1, November 23, 2011, http://www2.ohchr.org/english/bodies/hrcouncil/specialsession/17/docs/A-HRC-S-17-2-Add1.pdf (accessed December 5, 2011). Rome Statute, art. 7. See also Prosecutor v. Kupreskic et al., International Criminal Tribunal for the former Yugoslavia (ICTY,), Case No. IT-95-16, Judgement (Trial Chamber), January 14, 2000, para. 556. See Prosecutor v. Kupreskic et al., ICTY, Case No. IT-95-16, Judgment (Trial Chamber), January 14, 2000, para. 556: “[T]he requisite mens rea for crimes against humanity appears to be comprised by (1) the intent to commit the underlying offence, combined with (2) knowledge of the broader context in which that offence occurs.” See also Prosecutor v. Dusko Tadic, ICTY, Case No. IT-94-1, Judgment (Appeals Chamber), July 15, 1999, para. 271; Prosecutor v. Kayishema and Ruzindana, ICTR, Case No. ICTR-95-1-T, Judgment (Trial Chamber II), May 21, 1999, paras. 133-134. See Prosecutor v. Blaskic, ICTY, Case No. IT-95-14-T, Judgment (Trial Chamber), March 3, 2000, para. 257. Blaskic (paras. 258-259) listed factors from which could be inferred knowledge of the context: (a) the historical and political circumstances in which the acts of violence occurred; (b) the functions of the accused when the crimes were committed; (c) his responsibilities within the political or military hierarchy; (d) the direct and indirect relationship between the political and military hierarchy; (e) the scope and gravity of the acts perpetrated; and (f) the nature of the crimes committed and the degree to which they are common knowledge. Rome Statute, art. 28. Ibid. Some examples are provided in the chapter on command responsibility below. Rome Statute, art. 31(1) (d). Rome Statute, art. 31(1) (c). Universal jurisdiction is a legal principle under international law that gives the ability to the domestic judicial system of a state to investigate and prosecute a limited number of specific crimes, even if they were not committed on its territory, by one of its nationals or against one of its nationals (i.e. crimes that are beyond the traditional bases of jurisdiction, such as territoriality, active and passive personality.) Universal jurisdiction is justified because the crimes to which it applies are so grave that they are of concern to the international community as a whole, and all states share the responsibility to bring those who commit them to justice. There is no international convention that obliges states to exercise universal jurisdiction for crimes against humanity (contrary to war crimes and torture, for example.) However, it is generally agreed upon that international customary law allows states to exercise universal jurisdiction for crimes against humanity. A number of states have provided their courts with universal jurisdiction for crimes against humanity, notably when implementing the Statute of the International Criminal Court into their national legislation. States which have such provisions should seek to exercise universal jurisdiction against those responsible for the grave crimes committed against the civilian population in Syria, notably in the event they would travel to their territory. See statistics at Violations Documentation Center website, http://www.vdc-sy.org/ (accessed on December 3, 2011). “UN Human Rights Council strongly condemns abuses by Syrian authorities,” UN News Centre. Human Rights Watch interview with “Ahmed,” October 28, 2011. Human Rights Watch interview with “Jamal,” October 30, 2011. Human Rights Watch interview with “Abdullah,” November 5, 2011. Human Rights Watch interview with “Mansur,” July 25, 2011. Human Rights Watch interview with “Najib,” October 30, 2011. Imad Fahed al-Jasem later assumed the position of army chief of staff. Imad is a rank in the Syrian armed forces between major general and lieutenant general. Human Rights Watch interview with “Salim,” October 30, 2011. Human Rights Watch interview with “Mohamed,” October 27, 2011. Human Rights Watch interview with “Tahir,” October 28, 2011. Human Rights Watch interview with “Ameen,” October 28, 2011. Human Rights Watch interview with “Said,” October 29, 2011. Human Rights Watch interview with “Hamid,” October 31, 2011. Human Rights Watch interview with “Hisham,” October 31, 2011. Human Rights Watch interview with “Hani,” November 1, 2011. Human Rights Watch interview with “Amjad,” July 24, 2011. Human Rights Watch interview with “Hossam,” July 25, 2011. Human Rights Watch interview with “Fouad,” October 28, 2011. Human Rights Watch interview with “Ibrahim,” October 31, 2011. Human Rights Watch interview with “Faysal,” October 31, 2011. Human Rights Watch interview with “Afif,” November 2, 2011. Footage available at http://www.youtube.com/watch?v=PdfWDtNgzlE (accessed December 5, 2011). Human Rights Watch interview with “Hassan,” October 27, 2011. Human Rights Watch interview with “Ziyad,” October 31, 2011. Human Rights Watch, “We’ve Never Seen Such Horror” ; Human Rights Watch, “We Live as in War”; “Syria: Mass Arrest Campaign Intensifies,” Human Rights Watch news release; “Syria: Rampant Torture of Protesters,” Human Rights Watch news release. Human Rights Watch interview with “Mansour,” July 25, 2011. Human Rights Watch interview with “Bassam,” November 1, 2011. Human Rights Watch interview with “Mousa,” October 30, 2011. Human Rights Watch interview with “Zahir,” July 28, 2011. Human Rights Watch interview with “Fadi,” October 31, 2011. Human Rights Watch interview with “Ali,” October 28, 2011. Human Rights Watch interview with “Ghassan,” October 29, 2011. Human Rights Watch interview with “Ghassan,” October 28, 2011. Human Rights Watch interview with “Amir,” October 31, 2011. The witness explained that the release of the detainees was one of the demands put forward by the father of Hamza al-Khateeb, a 13-year-old boy who died from torture in the detention facility after Air Force intelligence arrested him on April 29, 2011, and whose death caused an outcry in Syria and internationally. Human Rights Watch interview with “Omar,” October 28, 2011. Human Rights Watch, “We’ve Never Seen Such Horror,” section II; Human Rights Watch, “We Live as in War,” section IV; “Syria: Rampant Torture of Protesters,” Human Rights Watch news release. See for example, “Syria: Security Forces Remove Wounded From Hospital,” Human Rights Watch news release; “Syria: Red Crescent Workers Under Attack,” Human Rights Watch news release. Human Rights Watch interview with “Munir,” November 5, 2011. Human Rights Watch interview with “Nizar,” November 1, 2011. See chapter “Syrian Government Response” below. Michael Weiss, “My Interview with a Defected Syrian Soldier; Plus, More Leaked Syrian Documents,” The Telegraph, August 9, 2011, http://blogs.telegraph.co.uk/news/michaelweiss/100100045/my-interview-with-a-defected-syrian-soldier-plus-more-leaked-syrian-documents/#disqus_thread (accessed November 20, 2011). Human Rights Watch, “We’ve Never Seen Such Horror,” Section II; See VDC list at http://www.vdc-sy.org. Human Rights Watch interview with “Abu Fahed,” October 28, 2011. Human Rights Watch interview with “Osama,” October 31, 2011. A recently released detainee told Human Rights Watch that while he was transferred from one detention facility to another around May 10, he talked to several detained defectors who said that they were being transferred to the Tadmor prison. Human Rights Watch interview, November 21, 2011. Human Rights Watch has documented extensive human rights abuse, torture, and summary executions in Tadmor prison. The authorities transferred hundreds of political prisoners from the Tadmor prison in 2001, but the prison reportedly continued to function as a military prison. For background information, see Human Rights Watch, A Wasted Decade: Human Rights in Syria during Bashar al-Asad’s First Ten Years in Power, July 16, 2010, http://www.hrw.org/reports/2010/07/16/wasted-decade. Human Rights Watch interview with “Abbas,” October 29, 2011. Human Rights Watch interview with “Yusuf,” October 31, 2011. See Local Coordination Committee Media Office, “Human Rights Violations Committed by the Syrian Regime, 15 March – 15 October,” November 7, 2011, http://www.lccsyria.org/wp-content/uploads/2011/11/SYR_HR_Violations_Mar15_Oct15_Final-3.pdf (accessed November 17, 2011). paragraph 15 (a) of the annex to Human Rights Council resolution 5/1, A/HRC/WG.6/12/SYR/1, September 2, 2011, http://www.upr-info.org/IMG/pdf/a_hrc_wg.6_12_syr_1_e.pdf (accessed December 6, 2011), para. 89. For more on the international response to the crisis in Syria, see Human Rights Watch, “We Live as in War,” Section V.
 “Syria unrest: Arab League adopts sanctions in Cairo,” BBC News, November 27, 2011, http://www.bbc.co.uk/news/world-middle-east-15901360 (accessed December 4, 2011). “Syria: UN human rights committee condemns crackdown,” BBC News, http://www.bbc.co.uk/news/world-middle-east-15834540 (accessed December 5, 2011). The Special Session of the Human Rights Council on the "Situation of human Rights in the Syrian Arab Republic" that took place on December 2, 2011, can be viewed at http://www.unmultimedia.org/tv/webcast/2011/12/vote-on-resolution-18th-special-session-human-rights-council-2.html (accessed December 5, 2011). The adopted resolution is available at http://www2.ohchr.org/english/bodies/hrcouncil/docs/specialsession/18/A-HRC-RES-S-18-1_en.pdf (accessed December 5, 2011). UN Human Rights Council, “Statement delivered on behalf of all Special Procedures mandate-holders of the United Nations Human Rights Council at the Eighteenth Special Session of the Human Rights Council on the situation of human rights in the Syrian Arab Republic,” December 2, 2011, http://www2.ohchr.org/english/bodies/hrcouncil/docs/specialsession/SpecialProcedures_MsFaridaShaheed.pdf (accessed December 7, 2011). Imad is a rank in the Syrian armed forces between major general and lieutenant general.